Need extra tuition? There are several clubs running that may be able to help! Proffesional tuition by qualified teachers, small class sizes, structured programmes and regular progress reports and feedback. Maths and English KS2,KS3,GCSE,A-LEVELS. Tuition in Classical Arabic by professional native speakers in an interactive environment, using modern learning resources. 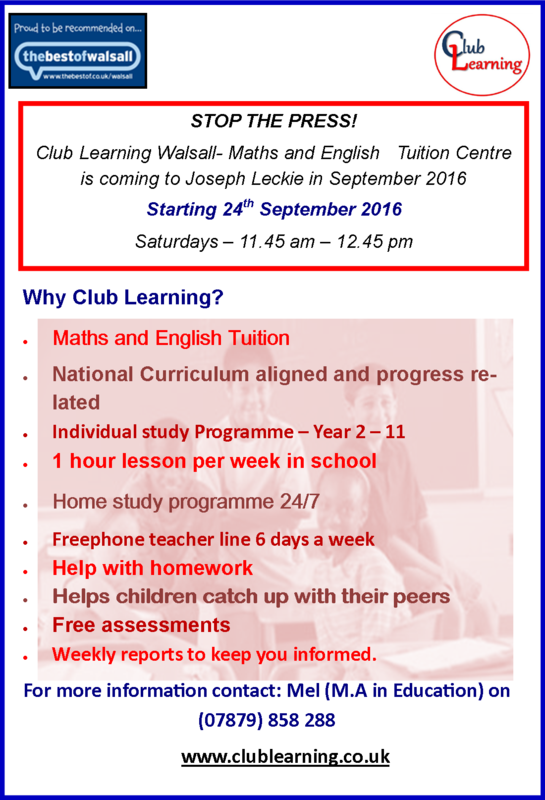 Classes 10am-3pm every Sunday at Joseph Leckie Academy. The centre provides excellent teaching at all levels from beginners at Year One through to Edexcel Arabic atGCSE AS Levels and adult classes. Affordable special discounts are available for additional family members. Prices start from £2.00 per hour. A bi-lingual language skills enhancement classes teaching basic Punjabi words, the Punjabi alphabet, numbers and Punjabi songs in a fun-filled environment for young children (18 months to 5 years). Also incorporates basic yoga stretches and movements which both parents and children can benefit from. EWA CIC is a supplementary Saturday school, which teaches the Polish language with elements of history and geography to children and adolescents aged 3 to 18 years. Young people in the oldest classes are being prepared for the British government exams and at the level of secondary school (A Level- large Baccalaureate).